These burgers pack all the flavor of your favorite game-day appetizer with less than half the fat and calories. Not to mention they are a perfect balance of protein, fat, and carbohydrates to keep your blood sugar stable while satisfying those greasy game-day cravings. Enjoy them for lunch or dinner or make the burgers ahead of time and grill them while tailgating or cheering on your favorite team to victory! First make coleslaw. Combine yogurt and vinegar in a small bowl. Add blue cheese, breaking up any large chunks so the cheese is evenly distributed. 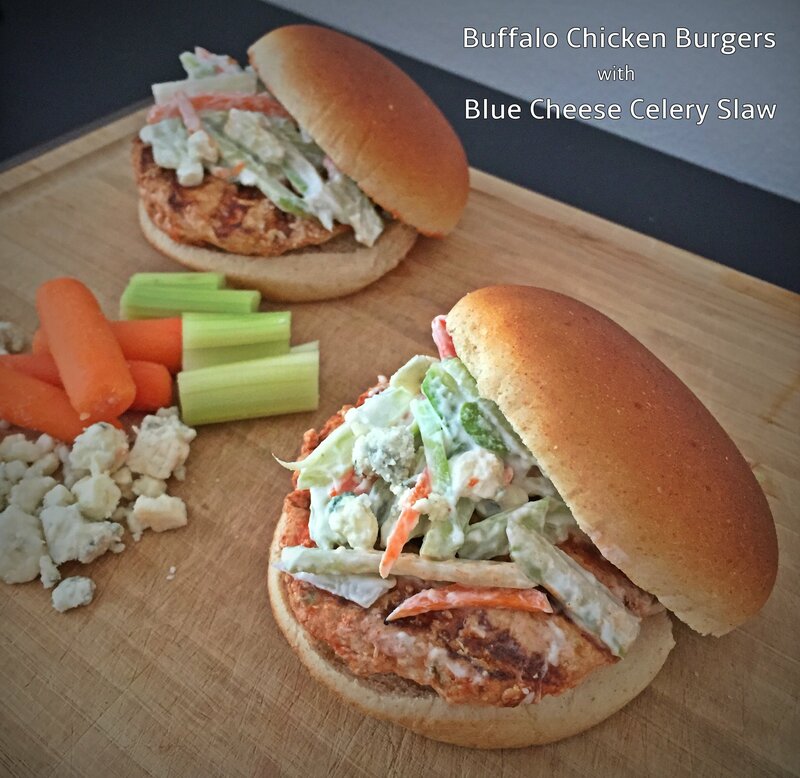 Toss celery and carrot strips with blue cheese/yogurt mixture and refrigerate until burgers are ready. To make burgers, add celery, onion, and garlic to a food processor or mini food chopper and pulse until chopped uniformly. In a large bowl, add ground chicken, celery mixture, egg white, and 2 tbsp of hot sauce. Stir until combined. Form mixture into 4 burgers. Heat a grill pan over medium-high heat liberally coated with cooking spray. Grill for 18-20 minutes, flipping halfway through cooking time. After cooking, brush each burgers with remaining 2 tbsp of hot sauce if desired. Place each burger on a bun and top with coleslaw.